Over 50,000 climbers a year enjoy the Gunks’ horizontal cracks, stiff grades, and amazing views. The first climbers in the area made their ascents before the invention of harnesses, cams, nuts, and nylon rope. 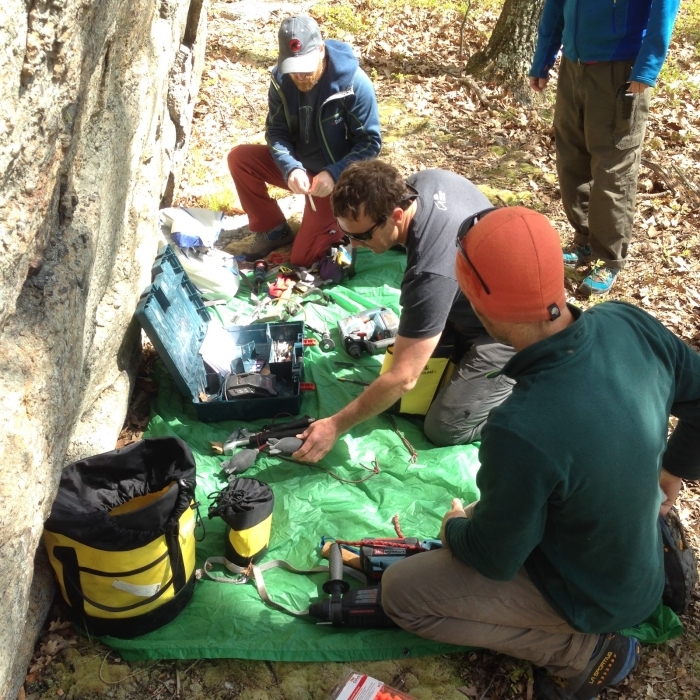 Today’s climbers come to the Gunks with the latest techniques and equipment, but they may use the same anchors as the first ascensionists. Pitons have rusted. Trees have died. 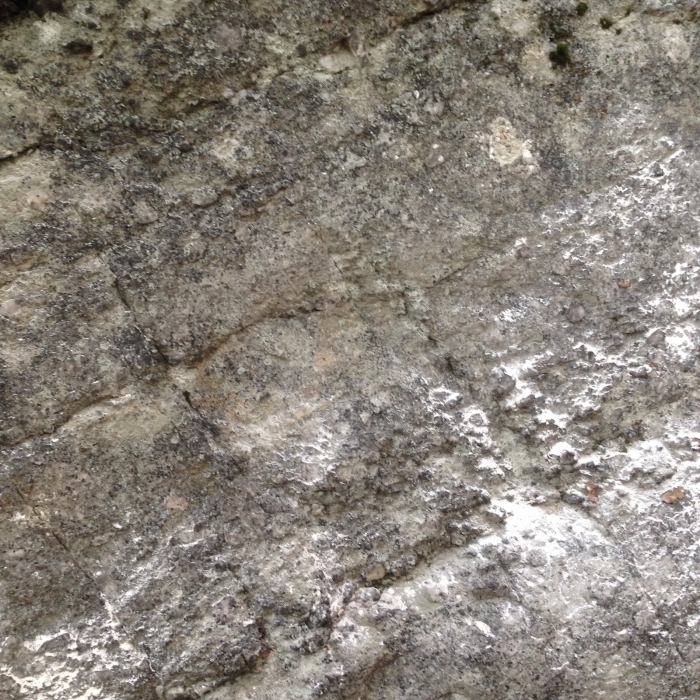 But climbers continue to use these anchors. 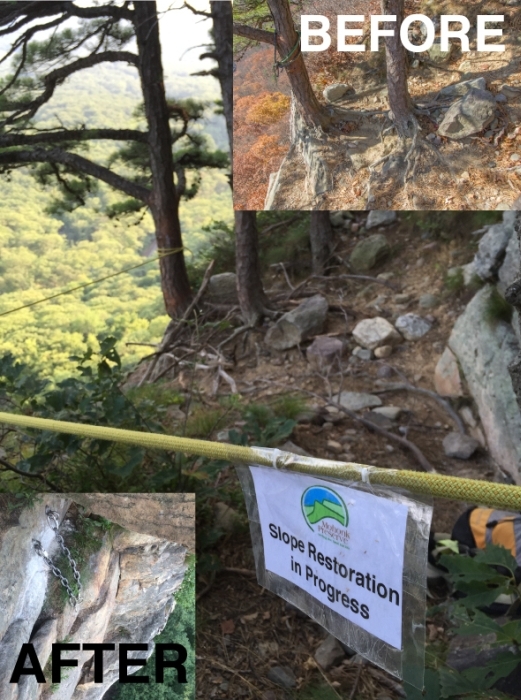 In 2014 the Mohonk Preserve which manages the Shawagunks ridgeline, and the Gunks Climbers Coalition (GCC) recognized the challenges that using existing anchors, especially trees, posed to the environmental health of the preserve and the safety of climbers. Mindful of the local ethics the GCC and Mohonk Preserve began a process of reviewing the state of the climbing anchors currently in use. It soon became apparent that fixed, bolted anchors would best benefit the conservation of the cliffs and climber safety. But who would place the bolts? Which bolts should be used? It would be GCC volunteers that would eventually place the fixed anchors, but who would train them and provide guidance? The GCC and Mohonk Preserve began researching various training methods and then approached the Petzl Technical Institute. Built in 2014, the Petzl Technical Institute is a center for knowledge, discussion, and the creation of solutions for those who work and play in the vertical world. The Petzl Technical Institute dispatched the technical team of Jesse Williams and Rick Vance to New York to advise the GCC and Mohonk Preserve. First the team began with classroom training and reviewing the climber’s options for chemical (glue-in) and mechanical bolting systems. With a wide variety of bolting solutions available it was important that the Gunks receive bolts that would withstand heavy use, harsh winters, and be easy to upgrade or replace in the distant future. With this knowledge the team went outside to practice placing and testing new bolts and replacing and repairing substandard bolts. With this knowledge the organizations that maintain climbing at the Gunks are better able to ensure the long term access and quality of Gunks climbing.